I have the BLU studio X, with the Global Sim Kit. Outgoing calls work perfectly, web works fantastic, but I have two issues. #1 incoming calls work about 50% of the time, does not matter if I am on wifi or 3g. #2 I get a roaming pop-up when I attempt to make a call "the card you are using is roaming, would you like to continue" I see no way to turn that off, running android 5.02. Thanks to anyone who has any ideas on solving these - this service would be fantastic if I could resolve them. 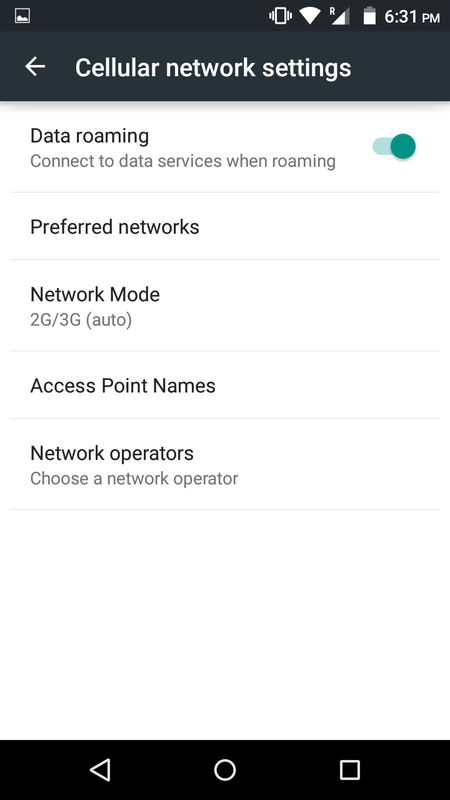 I've never used that version of android but isn't there a option to just allow all roaming? (it needs to) the card will roam on two networks in the us depending on the coverage and wireless bands in the area between t-mobile and at&t. where I'm at I've mostly been on at&t without much switching but it could be that your phones antenna is just not very good. yes it has the roaming option, and I have the roaming option turned on, however there is no option to ignore roaming warnings. I did uninstall the app, and re-install it, the calls seem to be coming to the phone better, but I still can not get rid of the roaming warning when I place a call. hmm most likely one of the operators is at&t while the other is t-mobile. that's weird they don't have different names. select one then try a call with each operator. also your not trying to make the call with the native dialer are you? your using the fp calling and texting application? I am using the FP messenger, but it brings up the native dialer on it's own. is the fp messaging app set as default? also I looked at a few forum posts and it seems a couple people have this problem with a different brand/model. also set it to 3g only.